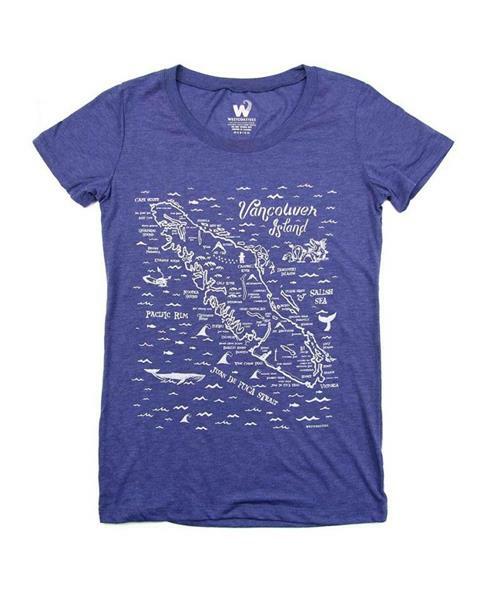 Van Isle Map is printed on a Poly-Cotton (50% Polyester / 50% Combed-Cotton) T-shirt. Unlike other Poly-Cotton T-shirts, Westcoastees' shirts are made with combed cotton, giving it a soft, worn in feel, superior drape, excellent colour fastness and durability throughout multiple washes. T-shirt has tailored regular fit. If you prefer to wear a more relaxed fit, they suggest to order one size up. They print only with discharge and water based inks to make their prints lightweight, soft and breathable. Made at the Westcoastees studio, in the beautiful Cowichan Valley on Vancouver Island, British Columbia, Canada.